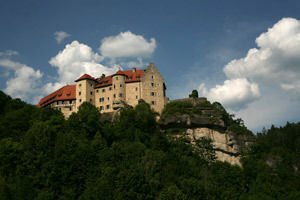 Rabenstein Castle, located in the heart of Franconian Switzerland is an amazing medieval fortress, dominating from its high plateau above the beautiful and picturesque valley Ailsbachtal. Rabenstein Castle is located east of the city of Mannheim and holds over 8 long centuries of history. Today the castle is a place to hold events and activities, visitors can enjoy the hunting falcons and other outdoor events. Rabenstein Castle was built sometime in the 12th century, and then belonged to the family Waischenfeld. From this period dates the oldest and most damaged part of the palace. Once the heirs of the family died, Rabenstein become property of the family Schlüsselbergs, which expanded the castle in 1219. The name of the castle comes from the fact that the family coat of arms Rabenstein includes an image of a raven (from German: Raben - raven). In the following centuries Rabenstein Castle changed owners, suffer damage, repairs, but in 1460 during the wars of the Princes in South Germany, the fortress was reconstructed and substantially expanded. After about 300 years ago, the family Rabenstein again managed to regain the castle around 1557 and undertake especially generous expansion of the structure of their property. Daniel von Rabenstein converted the palace in the Renaissance, the three-section complex’s fate was to be destroyed once again during the 30-year war. Around 1742 the family, godfathers of the castle Rabenstein had been ended. In the years between 1829-1830 year, a part of the palace was reconstructed. Today Rabenstein Castle entirely a tourist attraction, which has enjoyed great interest among visitors and nature lovers. Here except than seeing the museum of the castle, guests have the opportunity to stay in one of the 22 renovated rooms. In Rabenstein, there is a nice restaurant, and an even more pleasant garden dedicated to beer. Individually, Rabenstein is a place where predatory birds such as owls and falcons are trained. For guests of the palace are offered free demonstrations with special feathered creatures. Rabenstein Castle has excellent conditions for holding receptions, conferences, corporate events, weddings and other events, such capacity is up to 250 guests. Around May and August, in Rabenstein, are held traditional medieval culinary markets, during which groups from all over Germany present traditional crafts of the Middle Ages .